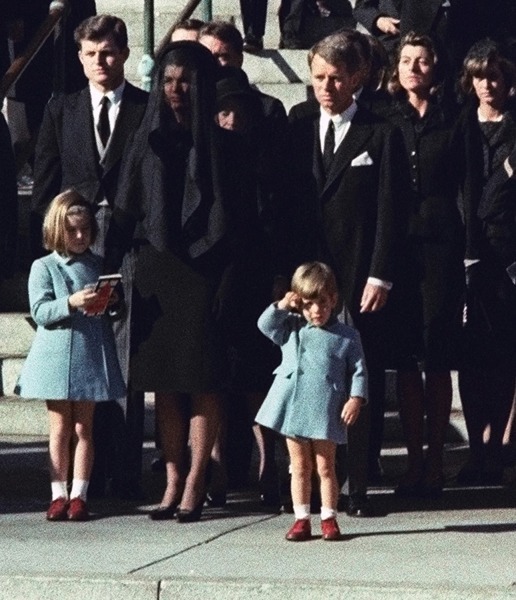 3-year-old John F. Kennedy Jr. salutes his father’s casket in Washington on Nov. 25, 1963, three days after the president was assassinated in Dallas. Now, we pause to remember that dark day in the country’s history — recalling a shared trauma that can feel both political and personal. But the clouds soon cleared, and the day began as bid to boost Kennedy’s re-election prospects in right-leaning Texas. Thousands of people are expected to flood a free event at Dealey Plaza, which is bounded by the Texas School Book Depository building where accused assassin Lee Harvey Oswald fired three shots from a 6.5-mm Mannlicher-Carcano rifle from his perch on the sixth floor. The somber ceremony will include short remarks from Dallas Mayor Mike Rawlings, the tolling of church bells and a moment of silence at 12:30 p.m. — the moment Kennedy was fatally shot. A monument on the infamous grassy knoll is slated to be unveiled during the mayor’s speech. The organizers behind the gathering wanted to wanted to put emphasis “in a positive way more on the legacy of President Kennedy,” Rob Kirk, a former mayor and a member of the planning committee, told the Associated Press. Dallas will also host other events on the occasion of the auspicious anniversary, including a ceremony at Parkland Memorial Hospital, where Kennedy was declared dead, to lower the American flag to half-staff, according to the AP. Meanwhile, in Fort Worth, the city’s Chamber of Commerce will host a breakfast at the hotel where Kennedy delivered his final speech — and spent the last night of his life. The JFK Presidential Library and Museum in Boston — just a short drive from Kennedy’s birthplace in Brookline, Mass. — will unveil a small exhibit of never-before-displayed artifacts and tokens from the president’s state funeral and host a musical tribute that won’t be open to the public. According to the library’s website, some of the priceless items on display include: the American flag that was laid over the president’s coffin and was later presented to his widow; the saddle, sword and boots from Black Jack, the riderless horse that accompanied the president’s horse-drawn coffin in the funeral cortege; the Green Beret placed by a serviceman on the president’s gravesite; and historic film footage and photographs of the state funeral.